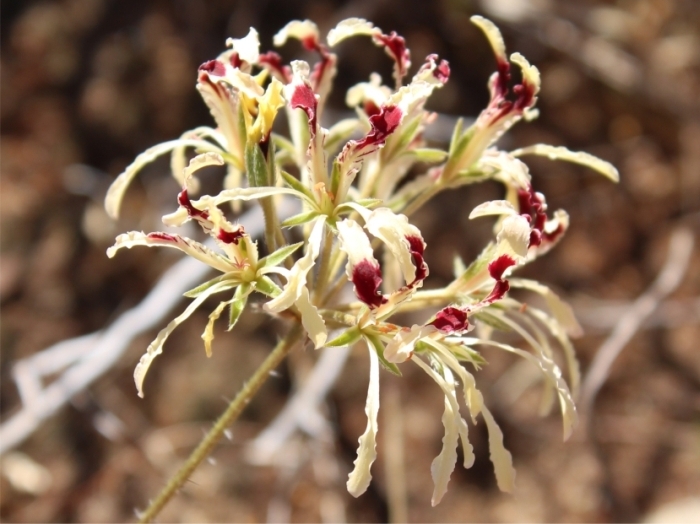 Pelargonium heterophyllum is a rare species from the Renosterveld, and one of South Africa’s most endangered plants. This is a tuberous-rooted species, up to 170 mm high; the tuber is ovoid or semi-rounded. It has very few leaves. The leaf blades are of variable shape; some are oblong or ovate (having an oval outline or ovoid shape, like an egg) and some are entire, whereas others are trilobed or tripartite, the lobes themselves trilobulate. The leaf lobules are blunt, absolutely entire, glabrous, but with stiff hairs on the margins and on the veins beneath. The stipules are fused to the petiole. The inflorescence is a composite umbel of up to 11 flowers. The flower petals are narrow, broader at the apex and tapered to the base. The 2 upper petals are spotted purple from the mid-section to the base, and the 3 lower petals are flesh-coloured. The flowers have 5 fertile stamens. Flowering occurs in late spring (Oct. –Nov.). This species has a red list status of Critically Endangered (CR). 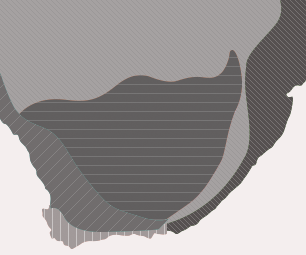 It has a very limited distribution range around the town of Darling in the Western Cape. A population reduction of >80% is estimated based on habitat loss to wheat cultivation, vineyards and urban expansion in the past 90 years (generation length 30–40 years) and a single location remains, EOO and AOO <10 km². This species continues to decline because of ongoing habitat loss. Pelargonium heterophyllum is probably the rarest and most threatened hoarea in South Africa at present and is one of South Africa’s rarest and most endangered plants. It may become extinct in the wild if the habitat degradation and destruction by crop cultivation, which is causing it to decline, continues. The major habitat of the species is Swartland Granite Renosterveld, Swartland Silicrete Renosterveld. It occurs in Renosterveld on clay flats or low hills. Geraniaceae is considered one of the distinctive families of the Cape floristic region. This is based on the fact that the most species of Pelargonium occur in the Western Cape Province. The genus Pelargonium, is regarded as a typical component of the Cape floristic region, comprising of more than 250 species. Within this genus, section Hoarea, is the largest section, with about 70 species described. Pelargonium hetrophyllum is likely to be the most threatened species in this genus. An early winter-growing, spring-flowering species. Growth cycle starts in about mid-June, later than most hoareas. The plants are in full leaf by mid-July. The foliage starts to wither in September and the plants are usually in flower from early to mid-October. Late rains and a cold, prolonged winter can postpone flowering for a few weeks. Seeds are dispersed into the environment in November when hot dry summer weather usually begins. This species sets little seed because it produces relatively few flowers. This, in part, is likely to explain the rarity of the plants. It also makes it challenging to observe or study the germination process in the wild. The Western Cape is known for extensive wheat and viticulture farming. Hoareas in pastoral areas, where most of the populations of many species are found, have adapted to the land use practices. Hoareas like most other South African plants, experience variations in the numerical strengths of different populations. The main factors which govern this are drought, fire and grazing pressures and patterns. South Africa is known to be a drought-prone region. This factor plays a significant role in geophytic pelargoniums. Some evidence suggests that the seed bank benefits from drought. This may enhance the germination process. Fire is a common occurrence in South Africa, having a significant role in the ecology and regeneration of species across many genera. In the absence of fire, species richness may decline. Smoke may possibly aid germination in hoarea seeds. This is difficult to determine as seed germination is unpredictable and irregular. Overgrazing is a major factor associated with plant population reductions. Historically, grazing was by large herds of antelope in an unconfined space. Once resources were depleted they would move to greener pastures. This has been replaced by livestock in restricted fenced-off areas. Dry times are periods of stress for hoareas. Seedlings that managed to survived, are trampled and the larger tubers damaged, particularly by goats, which graze shrubs during dry times. This species is incredibly rare and no record of cultural or medicinal uses could be found. This is a very rare species but considering that the genus Pelargonium has a number of species that are used medicinally, this species could have certain medicinal properties. Best cultivated in a mixture comprising of half silt and half sandy ordinary soil, which is similar to the conditions under which the plants grow naturally. Plants may also be grown in a clay-based or loamy soil (sandy loam), provided that they are cultivated in clay pots which will absorb any excess moisture. Plants should be watered from autumn until spring (May until September). 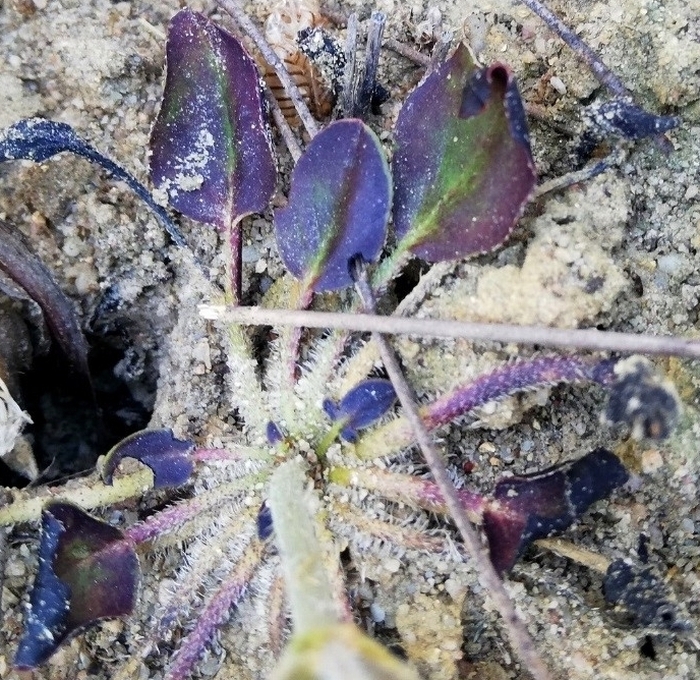 Water should be withheld gradually as the plant starts to enter dormancy. The plants should be kept completely dry whilst dormant, and watering continued only at the beginning of the following winter (May). Seeds should be sown just under the surface of the soil in autumn (April and Ma)y and seedlings watered regularly throughout the winter growing period. A small quantity of bone meal well mixed into the germination mixture, aids the development of the young tubers. Seed-grown tubers usually flower from the second year onwards. Craib, C. 2001. Geophytic pelargoniums field and cultivation studies of Pelargonium section Hoarea. Umdaus Press, Hatfield, Pretoria. Gibby, M., Hinnah, S., Marais, E.M. & Albers, F.1996. Cytological variation and evolution within Pelargonium section Hoarea (Geraniaceae). Plant Systematics and Evolution. Vol 23 (1): 111–142. Helme, N.A. & Raimondo, D. 2007. Pelargonium heterophyllum Jacq. National Assessment: Red List of South African plants version 2017.1. Accessed on 2018/11/27. Van der Walt, J.J.A. 1985. A taxonomic revision of the type section of Pelargonium L’Herit. (Geraniaceae). Bothalia. Vol 15.3 & 4: 345–385. Van der Walt, J.J.A. & Vorster, P.J. 1983. Phytogeography of Pelargonium. Bothalia. Vol 14.3 & 4: 517–523. Webb, J.W. 1984. The Pelargonium family. Croom Helm.